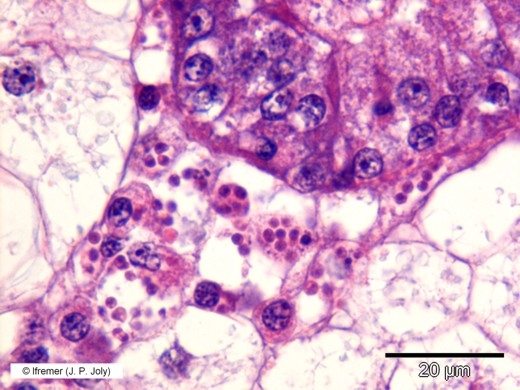 Bonamiosis is a lethal infection of the haemocytes (picture 1) of flat oysters sometimes accompanied by yellow discoloration and extensive lesions on the gills and mantle. However, most of the infected oysters appear normal. Histologically, lesions occur in the connective tissue of the gills, mantle, and digestive gland. This intrahaemocytic protozoan quickly becomes systemic with overwhelming numbers of parasites coinciding with the death of the oysters. Although the life cycle outside the host is unknown, it has been possible to transmit the disease experimentally in the laboratory by cohabitation or inoculation of purified parasites. The species Bonamia ostreae and B. exitiosa are observed in Europe. 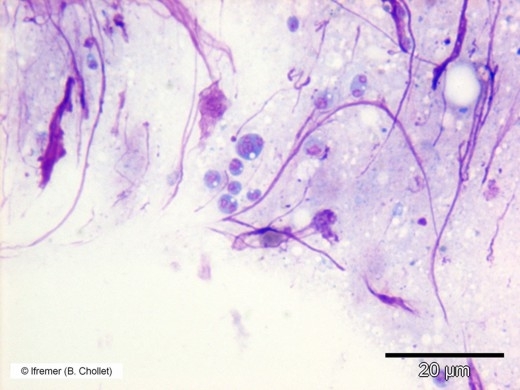 Picture 1 : Bonamia ostreae cells inside haemocytes and free in the connective tissue surrounding the digestive gland of a flat oyster Ostrea edulis (H&E staining). Bonamia ostreae and B. exitiosa are protistan parasites of the phylum Haplosporidia responsible for bonamiosis also named microcell disease or haemocyte disease of flat oysters Ostrea edulis in Europe. B. exitiosa has been observed in flat oysters Ostrea edulis from Galicia (Spain) in 2007. Tissue imprints (picture 2) can be made using oyster spat or heart ventricle or gills from live adult hosts. Bonamia ostreae appears as small spherical or ovoid organisms (2-5 µm wide) inside haemocytes. However, the parasite might also occur extracellularly. Using Wright, Wright-Giemsa or equivalent stain (e.g., Hemacolor, Merck; Diff-QuiK, Baxter) these parasites show a basophilic cytoplasm and an eosinophilic nucleus. Multinucleated cells can be observed (picture 2). Picture 2 : Heart imprint of European flat oyster Ostrea edulis showing free cells and some diplocaryotic and a multinucleate cell of Bonamia ostreae (Hemacolor® staining). Histopathology should be performed on tissue sections that include gills, digestive gland, mantle, and gonad and stained with hematoxylin and eosin. 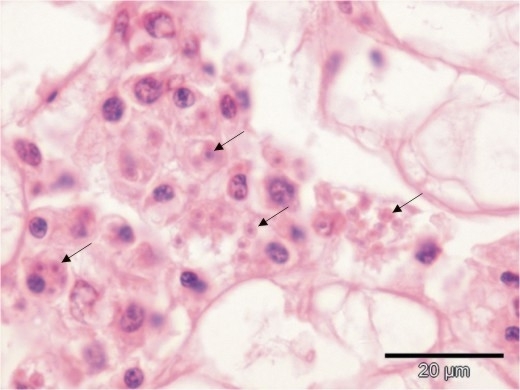 In infected oysters, parasites can be observed as very small cells of 2-5 µm wide, within the haemocytes or freely in connective tissue (picture 3) or sinuses of gill, gut and mantle epithelium, often associated with intense inflammatory reaction. Tissue imprints appear less reliable than histopathology for the detection of the parasite in case of low level of infections. However, tissue imprints are more rapid and less expensive than histopathology (cost for one individual is estimated at about 5 € and 20 € -including personal cost- respectively). Two PCR protocols with two different primer pairs targeting the SSU rDNA have been developed for Bonamia ostreae: the first one uses the primer pair Bo-Boas (Cochennec et al. 2000) and the second one the primer pair CF-CR (Carnegie et al. 2000). Based on target DNA sequence similarity, the first assay should amplify all microcell haplosporidians and the second one at least Bonamia ostreae and B. exitiosa. These assays have not bee validated directly against one another but they appear to be roughly equivalent in sensitivity. PCR developed by Cochennec et al. (2000) has been compared to histopathology and cytology together (Balseiro et al. 2006). Sensitivity of PCR was 92% (between 64 and 69% for histological methods together) and specificity of PCR was estimated between 85 and 90% (97% for histological methods together). See the page "SOPs & Quality" for a Bonamia PCR-RFLP protocol. Both PCR protocols previously described in the section “screening techniques” can also be used as confirmatory techniques. However, both assays are not species specific. A protocol of RFLP applied on PCR products obtained using Cochennec et al. PCR technique has been developed and allows to differentiate Bonamia ostreae, B. exitiosa and B. roughleyi (Cochennec et al. 2003; Hine et al. 2001). This technique needs to be validated. The PCR-RFLP standard operating protocol can be found on the page "SOPs". Two in situ hybridization (ISH) protocols have been developed. The first one (Cochennec et al. 2000) uses a 300 bp digoxigenin-labeled probe produced by PCR and using primer pairs Bo-Boas (picture 4) and the second one (Carnegie et al. 2003) uses three fluorescein-labeled oligonucleotide probes (UME-BO-1, UME-BO-2 and UME-BO- 3). The probe Bo-Boas is able to detect Haplosporidium nelsoni in Crassostrea virginica, Bonamia exitiosa in Ostrea chilensis but not Mikrocytos mackini in C. gigas. The specificity of the oligoprobe cocktail UME-BO-1, 2 and 3 has been tested and proved against H. nelsoni but this ISH assay probably detects other microcells including at least B. exitiosa. 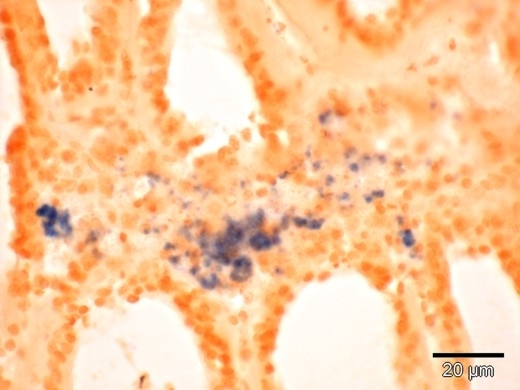 Picture 4 : ISH reaction with the digoxygenin-labeled probe used on infected gill of Ostrea edulis showing Bonamia cells (in blue) inside the connective tissue (Bismarck Brown counterstain). In situ hybridization can help to detect early infection which is more difficult to detect in traditional histological sections. 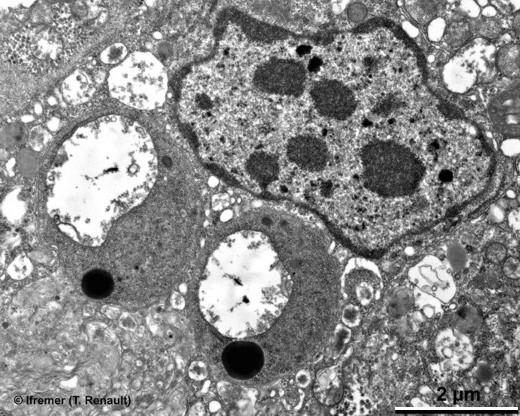 Transmission electron microscopy is time consuming and can not be applied in routine but is recommended when Bonamia like parasites are described in a new host species. Moreover, transmission electron microscopy can help to differentiate B. ostreae from other members of this genus like B. exitiosa. Different stages including uninucleate, diplocaryotic and plasmodial stages have been reported. Intracellular structures include mitochondria, haplosporosomes, Golgi apparatus and persistent intranuclear microtubules. Picture 5: TEM micrograph showing two Bonamia ostreae cells inside an haemocyte of Ostrea edulis heart tissue. Note the lipid bodies (in black) and the large "vacuoles" (= mitochondria). Nucleus and cytoplasm have the same image grey density and the former can hardly be visible at this magnification. Dense forms of Bonamia ostreae are denser, slightly smaller in size in comparison to Bonamia exitiosa, have less haplosporosomes, mitochondrial profiles and lipoid bodies per ultrastructure section, and have larger tubulo-vesicular mitochondria (picture 5) than B. exitiosa. In addition, dense forms of Bonamia ostreae lack nuclear membrane-bound Golgi/nuclear cup complexes and a vacuolated stage (Hine et al. 2001). Sequencing is recommended as one of the final steps for confirmatory diagnostic. Targeted regions are SSU rDNA and ITS1. Obtained sequences should be compared with available ones in gene banks. Sequencing needs to be used for species confirmation between Bonamia ostreae and B. exitiosa. Protocols for PCR and in situ hybridization are available in pre cited articles. PCR technique developed by Cochennec et al (2000) has been submitted to several validation tests against histological methods. However, validation is still required for in situ hybridization methods. In some cases, highly infected oysters might present some gill indentations. When suspected, Bonamia ostreae can be detected by heart or gill imprints. In parallel, pieces of gill can be fixed in ethanol for PCR analysis and a section of oysters should be fixed in Davidson’s fixative for histological examination. Bonamia ostreae is listed by the EU Directive 2006/88/EC as a non exotic pathogen. Bonamia ostreae is listed by the OIE Manual of Diagnostic Tests for Aquatic Animals (2009 version) and by the Aquatic Animal Health Code (2009 version). The tests are discussed at the annual European EURL/NRL meetings. Use the methods according to the table below for screening and confirmation. Balseiro P., Conchas R.F., Montes J., Gomez-Leon J., Novoa B. and A. Figueras (2006). Comparison of diagnosis techniques for the protozoan parasite Bonamia ostreae in flat oyster Ostrea edulis. Aquaculture 261 (4): 1135-1143. Carnegie, R. B., Barber, B. J., Culloty, S. C., Figueras, A. J., and Distel, D. L. (2000). Development of a PCR assay for detection of the oyster pathogen Bonamia ostreae and support for its inclusion in the Haplosporidia. Diseases of Aquatic Organisms 42(3): 199-206. Carnegie, R. B., Barber, B. J., and Distel, D. L. (2003). Detection of the oyster parasite Bonamia ostreae by fluorescent in situ hybridization. Diseases of Aquatic Organisms 55(3): 247-252. Cochennec, N., Le Roux, F., Berthe, F., and Gerard, A. (2000). Detection of Bonamia ostreae based on small subunit ribosomal probe. Journal of Invertebrate Pathology 76(1): 26-32. Cochennec Laureau, N., Reece, K. S., Berthe, F. C. J., and Hine, P. M. (2003). Mikrocytos roughleyi taxonomic affiliation leads to the genus Bonamia (Haplosporidia). Diseases of Aquatic Organisms 54(3): 209-217. Hine, P. M., Cochennec Laureau, N., and Berthe, F. C. J. (2001). Bonamia exitiosus n. sp (Haplosporidia) infecting flat oysters Ostrea chilensis in New Zealand. Diseases of Aquatic Organisms 47(1): 63-72.